Inventory We are a resale marketplace, not a box office or venue. Ticket prices may exceed face value. This site is not owned by Walnut Creek Amphitheatre . 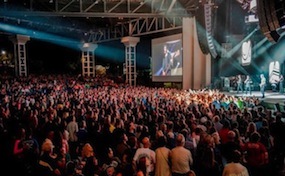 The Walnut Creek Amphitheatre is an outdoor amphitheatre in Raleigh, North Carolina that specializes in hosting large concerts. The amphitheatre is part of a 77-acre complex located on the west bank of Walnut Creek, southeast of Raleigh near the I-40/US 64/I-440 (Beltline) interchange. It was built by the City of Raleigh with private sector participation at a cost of $13.5 million and opened in 1991; the inaugural act was The Connells. Seating capacity is about 6,847, of which about half are under cover; the open lawn can accommodate another 13,653. The venue was formerly known as Alltel Pavilion, Hardees Walnut Creek, and simply Walnut Creek Amphitheatre. WalnutCreek.AmphitheatreRaleigh.com is not affiliated with any primary box office or supplier. We are a privately owned and operated business specializing in sales in the secondary market. To buy tickets for any Walnut Creek Amphitheatre in Raleigh simply click on the event of interest or call our operators at anytime.